The chance that Curaçao will have a successor to Jean-Julien Rojer within a few years has become a lot bigger last night. The 30 biggest tennis talents of Curaçao received a masterclass from two former professional tennis players at the Center Court of the Curaçao Tennis Legends: Henri Leconte and Sjeng Schalken. The masterclass for the tennis youth was one of the side events of the Curaçao Tennis Legends, which takes place from tomorrow to Saturday at Santa Barbara Beach & Golf Resort in Nieuwpoort. 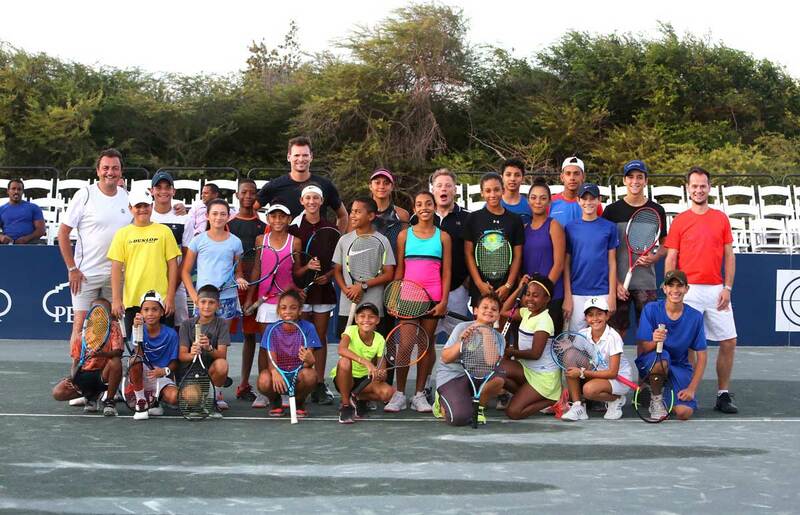 One of the objectives of the tournament is to promote the tennis sport in Curaçao and to get children moving. This masterclass was organized to inspire and motivate the talents to pursue their tennis dreams. Tomorrow there will be clinics at Brionplein in Otrobanda and Saturday there will be a clinic for children of the foundation Siloam.